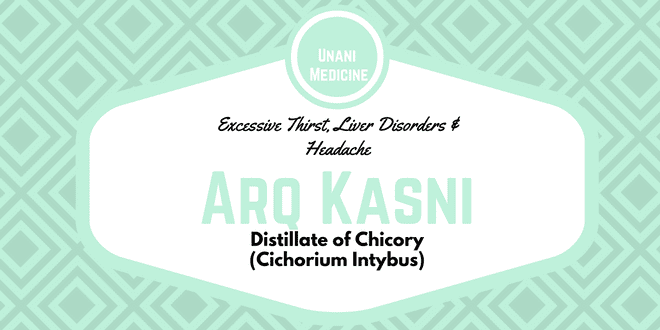 Arq Kasni (Chicory Distillate) is a Unani Medicine and ayurvedic medicine, famous among ayurvedic physicians due to its effectiveness in liver disorders. It acts as hepatoprotective and protects the liver from the damage due to toxins. It is used to reduce excessive thirst, inflammation of the hepatic tissue and headache. In addition, it is also helpful for sleeplessness, dysmenorrhea, causalgia (burning pain in a limb), loss of appetite due to liver disease, hepatomegaly, splenomegaly, jaundice and dysuria (Painful or difficult urination). Arq Kasni is prepared from seeds of Cichorium Intybus using distillation method. Take 10 liters water and soak 500 grams Cichorium Intybus Seed in it at least for 24 hours. Then distil 4 liters aqua (Distillate) using distillation equipment. Arq Kasni or Distillate of Chicory (Cichorium Intybus) seeds is an hepatic stimulant, anti-inflammatory, and promotes the secretion of bile from the liver and gallbladder into the duodenum. Kasni seeds are likely to promote bilirubin uptake from the blood into the liver and increase secretion of conjugated bilirubin in the bile, which metabolizes in the intestine to form urobilinogen. Some urobilinogen is reabsorbed and some amount is excreted in the feces. Therefore, Arq Kasni helps in the treatment of hyperbilirubinemia and jaundice. The most important mechanism is due to its potent anti-inflammatory effects on the liver, which help to treat hepatitis or reduce inflammation in the hepatic tissue. In viral hepatitis, it can help along with other antiviral herbs. The general dosage of Arq Kasni (Chicory Distillate) is as follows. Arq Kasni (Chicory Distillate) is likely safe for most individuals when taken in recommended dosage. There are no side effects observed with Arq Kasni (Chicory Distillate). The safety profile of Arq Kasni is not well-established for pregnant women. The effects of Arq Kasni may be dose dependent and self-medication can become dangerous. You should consult a physician before using Arq Kasni during pregnancy. Arq Kasni is likely to be safe to consume by lactating mothers when indicated and within recommended dosage. There are no adverse effects reported with the use of Arq Kasni in lactating mothers and breastfeeding babies. There are no absolute contraindications for Arq Kasni (Chicory seed Distillate).